This has been a family favorite for years. It’s a beautiful soup course to accompany holiday meals, but also hearty enough to be a main course served with salad and bread any time of the year. 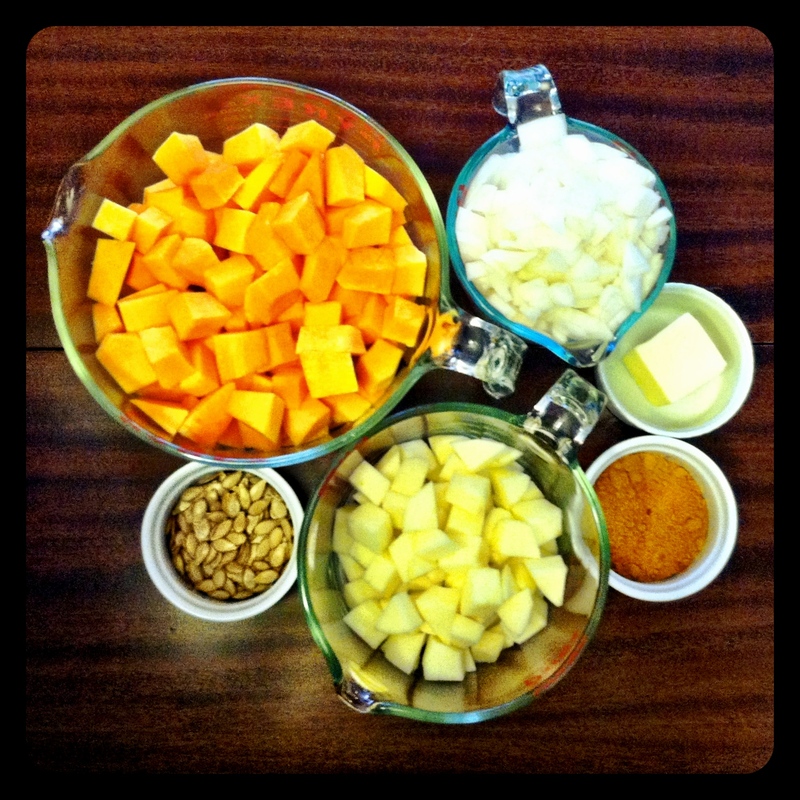 One large butternut squash will yield enough meat, or use a regular sized one and supplement with a small acorn squash. You can either peel the squash and put raw chunks in the pot, or cut it in half and roast it until you can more easily scoop out the meat and then reduce the time in the pot. Of course, this recipe becomes significantly easier if you purchase pre-chunked squash, but the tradeoff is no seeds for garnish. No matter how you cut it (Ha! Ok sorry. ), this is a really wonderful dish. You can easily substitute oil instead of butter for a vegan version – but if that’s not your thing the butter does add richness. In a large stew pot, melt the butter over medium heat and stir in the curry powder, salt and pepper. Then add the onions and cook for 15 minutes, stirring occasionally. In the meantime, rinse the squash seeds until clean, pat dry and toss them in grape seed oil plus a little salt and pepper. Roast them in the oven at 300° until golden brown. Add the squash, apples and broth to the curry and onions. Bring to a boil, reduce heat and simmer for 20 minutes or until the squash is tender through. Remove from heat. Use an immersion blender directly into the pot to blend all the ingredients until creamy. If you don’t have an immersion blender, you can also use a regular blender or food processor – it’s just messier and takes several batches. Allow to sit for 10 minutes. 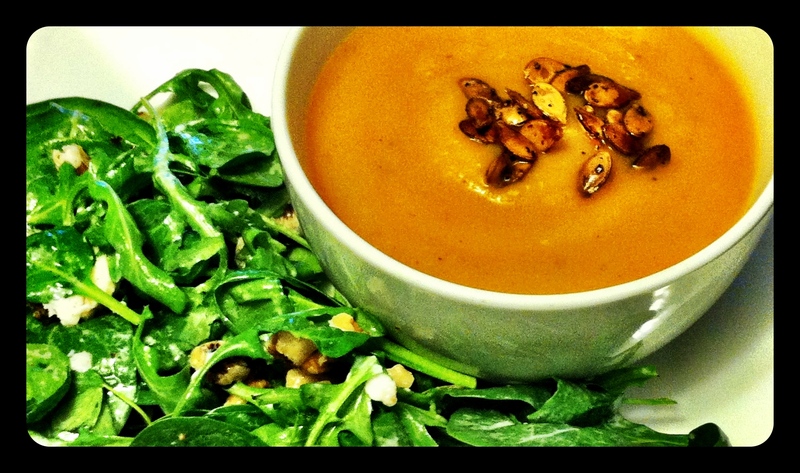 Serve soup garnished with toasted seeds. As the countdown to Pi(e) Day continues, I’ve made a couple of savory pies for dinners. The first is an adaptation of this recipe that I substituted in several places with what I had on hand. Turned out great, and will be a general formula for future savory pies for sure! Preheat the oven to 400° and toss the squash chunks in half of the oil plus the salt and pepper. Roast the squash on a baking sheet for 20-30 minutes until golden. 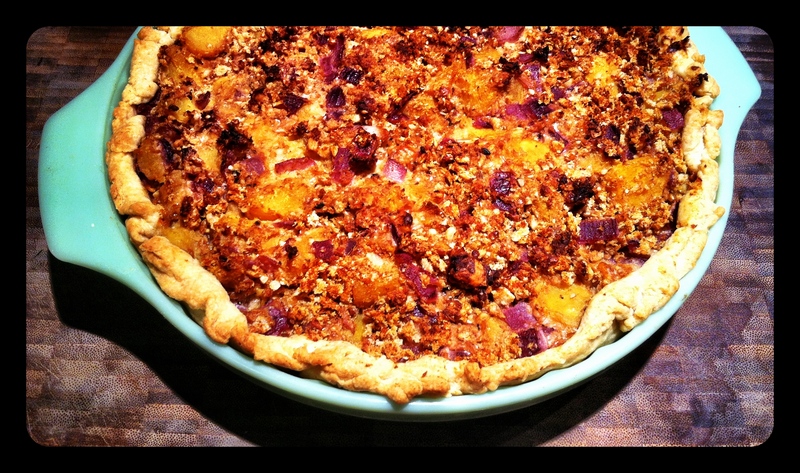 You can simultaneously prebake your pie crust for 10-15 minutes if you like. In the meantime, sauté the onion over medium heat in the other half of the oil. After 5 minutes, add the white wine and cook it down for another 5 minutes or so. If you’re making homemade bread crumbs, toast 2 to 3 pieces of bread until they are dry, break them into chunks and toss in a food processor. You can also add the walnuts and cheese as these three together will make the crumb mix. When everything is done, mix the roasted squash, sautéed onions, lightly beaten egg, and half of the bread crumb mix together in a big bowl. Scoop filling into the crust, sprinkle remaining bread crumb mix on top, and bake for 30-40 minutes until the crust is golden. Let sit for 10 minutes before slicing. Make sure to also: wash those squash seeds, toss them in oil, salt and pepper and roast them on a baking sheet for 20-30 minutes, stirring occasionally, until golden brown. Yum! !